Leah Demarest and Rachel Schwartz are AmeriCorps VISTAs at John Marshall Law School Fair Housing Legal Clinic and Chicago Lawyers’ Committee for Civil Rights, respectively. 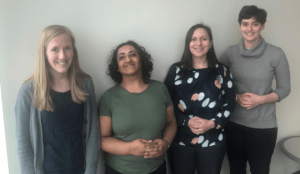 (Left to right) Leah Demarest, Amrita Narasimhan, Barbara Barreno-Paschall, and Rachel Schwartz have been working hard to plan the ‘Our Chicago’ Community Summit on April 28. April 2018 marks 50 years since the passage of the federal Fair Housing Act. In light of this historic milestone, Chicago Lawyers’ Committee for Civil Rights and the Policy Research Collaborative at Roosevelt University, with Chicago Area Fair Housing Alliance, the John Marshall Law School Fair Housing Legal Support Center & Clinic, Northside Community Resources, and Open Communities, are convening a one-day community summit at Roosevelt University on April 28 called Our Chicago: The Fight and Future of Fair Housing at 50. The summit will bring together advocates, experts, and community members to learn Chicago’s history, share tools, and organize together for equity and justice. Planning the summit has kept members of our organizations busy since January. As VISTAs at Chicago Lawyers’ Committee and the John Marshall Law School Fair Housing Legal Clinic, we have been helping to coordinate the summit’s childcare option, design the children’s curriculum, plan for interpretation and accessibility accommodations, and prepare for the panels and workshops, which range from know-your-rights trainings and intake clinics to a keynote session featuring WBEZ South Side reporter and author, Natalie Moore. We recently took a step back from the logistical work to reflect on the significance of the occasion with our colleagues, Amrita Narasimhan and Barbara Barreno-Paschall. As a Test Coordinator at the Fair Housing Legal Clinic, Amrita investigates violations of federal, state, and local fair housing laws in Chicagoland. Barbara is a Senior Staff Attorney with Chicago Lawyers’ Committee’s Housing Opportunity Project. She uses litigation and policy advocacy to confront individual and systemic manifestations of housing discrimination. The law’s enactment was a hard-fought victory for opponents of racial discrimination and segregation in housing, and it rested in part on the work of civil rights leaders in Chicago. In 1966, Dr. Martin Luther King, Jr. led the Chicago Freedom Movement, a campaign for open housing and racial justice in Chicago that faced violent opposition. The efforts of Dr. King and other civil rights activists yielded some concessions from city officials, but at the federal level, advocates would not garner majority congressional support for the proposed law until after Dr. King’s assassination on April 4, 1968. At that point, riots broke out in major cities across the country and President Lyndon B. Johnson, along with Senators Edward Brooke and Walter Mondale, pushed Congress to pass the Fair Housing Act to honor Dr. King and his legacy. The law was enacted on April 11, 1968, just seven days after Dr. King’s assassination, but many of its promises remain unfulfilled today. Residents still feel the effects of practices like redlining in the ways that lenders, renters, homebuyers, and other institutions perceive, interact with, and invest in their communities. Residents face unjust taxation, discriminatory lending practices, gentrification, disinvestment, and refusals to rent, among other barriers to opportunity and equity. “When you’ve had neighborhoods that have been redlined and segregated, and then when you add these other inputs that affect where people live, issues of segregation are compounded and reproduced,” Amrita said. Barbara elaborated that the summit will offer a platform for communities to come together to organize and exchange ideas around shared concerns and goals. The free community summit will be held on Saturday, April 28 at Roosevelt University (425 S. Wabash Ave) 9:30am to 3:30pm. The event will feature a lunchtime keynote session with Natalie Moore; interactive exhibits; a children’s program on fair housing; free childcare; know-your-rights and intake clinics for residents on housing discrimination; a participatory data workshop; community conversations on affordable housing, rent control, equitable development, and property tax discrimination; and more! About 15 hours ago from Housing Action IL's Twitter via Hootsuite Inc.